Bright yellow, potato-shaped, gibberish-speaking creatures that are easily excited. What’s not cute about that? 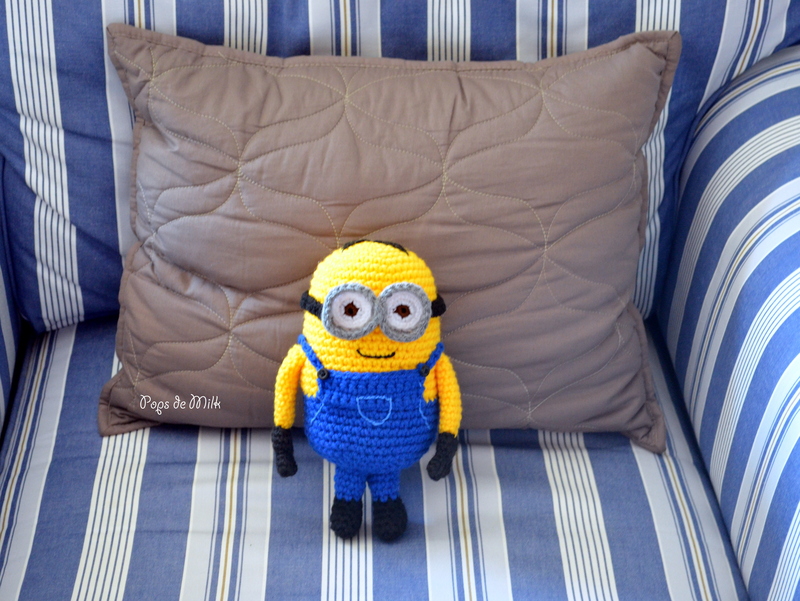 I didn’t know until one of Jay’s co-workers asked if I would crochet a Minion for him. I watched both Despicable Me movies and instantly fell in love with the Minions. LOVE those Minions. I came up with a fun pattern for a Minion and I’ve chosen to make Dave because aside from being so damn adorbs, he – like me – likes ice cream, video games, and he bakes! 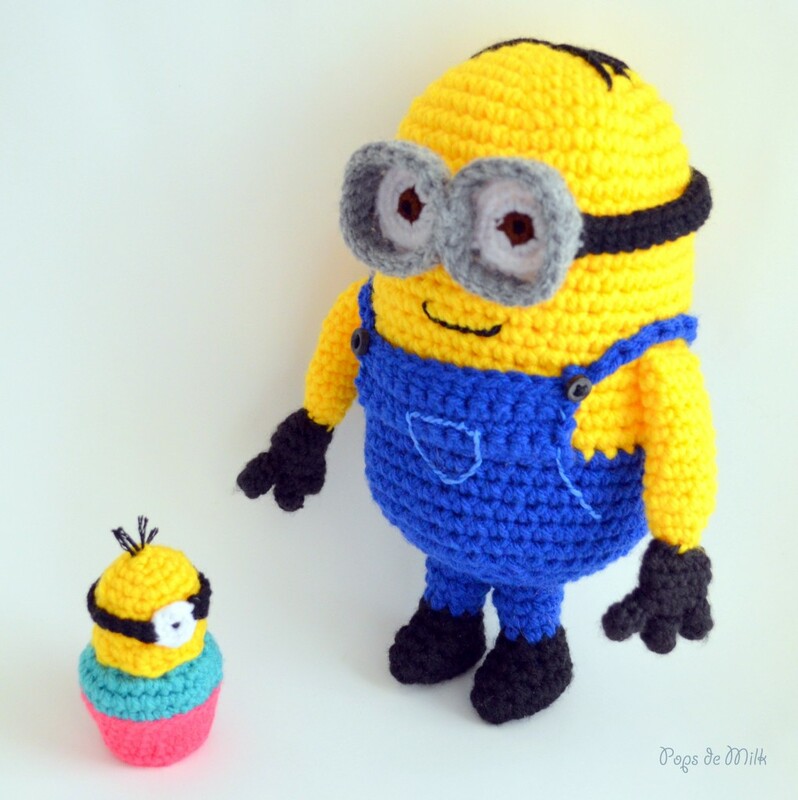 Not sure how big he would be in real life but for now, enjoy this 8.5 inch version of Dave the Minion. Oh! And did I mention he comes with a cupcake? Below is the free version of the pattern. But if you’d like to support my crafty creations you can purchase the PDF version in my shop. -Worsted yarn in yellow, black, blue, white, brown, and grey or silver. Using yellow yarn and 4.00mm hook. Dec to close, fasten off and weave in ends. Using blue yarn and 4.00mm hook. In last round ch 16 and fasten off leaving long tail for sewing. Using black yarn and 4.00mm hook. Using yellow yarn and 3.50mm hook. Use long slipknot tail to sew later. Starting with hand base, using black yarn and 3.00mm hook. Fingers, using black yarn and 2.50mm hook. Ch 2 and 5 sc in second ch from hook. Using brown yarn and 3.00mm hook. Using grey or silver yarn and 3.50mm hook. Round 2: sc in each st ending with sl st. Fasten off and weave in ends. Repeat to make second piece but leave a long tail – sew in the middle to create goggles. Using black yarn and 3.50mm hook. Ch 46, sc in 2nd ch from hook and across. Fasten off and sew to goggles. Sew overalls flap to body where blue yarn begins. Attach buttons and embroider pants detail with lighter blue embroidery thread. Sew fingers to hands, hands to arms, arms to body just under overalls strap. For goggles, sew eyes to inside goggle piece then attach the straps and then stitch to head. Using pink yarn and 3.00mm hook. Using yellow yarn and 3.00mm hook. Round 9: [2 dc in next st, hdc in next st, sc in next st] repeat 5 times, sl st in last st. Fasten off and leave tail for sewing. Using white yarn and 3.00mm hook. Using black yarn and 3.00mm hook. Ch 20. Fasten off and sew to eye. Attach to body. Stuff with fibrefill and sew to cupcake bottom. Use embroidery thread for pupil and hair. Heehee thank you so much! I’m so glad you had fun making him and he does look awesome, nicely done! I’m Pinning this! This is great! I feel like I have to make this. Great job on this! GREAT JOB!! 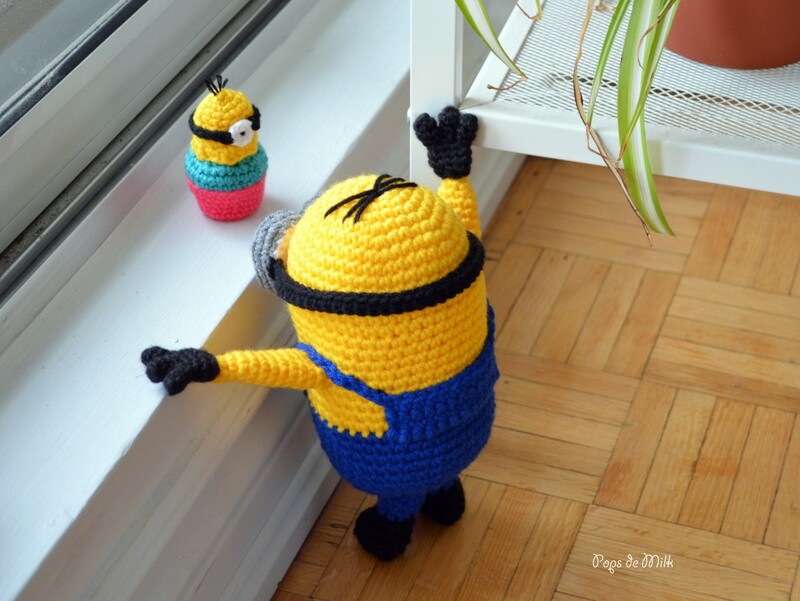 Best looking crocheted minions I’ve seen so far! THANK you so much for sharing your pattern. Aww, thank you so much Tori! Looks good where did you say you can get the pattern. Hi Callum, there is a link to the pattern at the end of the blog post. Hi, I am sorry if I am missing it, but do you have the pattern for the cupcake? Hi I am making the minion at the moment and I can’t get the fingers to look right, am I meant to work in continues rounds? I am doing this and it doesn’t look like three fingers. What am I doing wrong? Hi! I’ve een reading your website forr a long time now and finally got thhe bravery too go ahead and givfe you a shout outt from Austin Texas! Hi I am in the process of making Dave and am having troubles with him standing up, do you have any suggestion?. Also how many fingers does he have? He is so cute! or maybe make a sturdy wire frame to place inside the body? There are 3 fingers per hand. 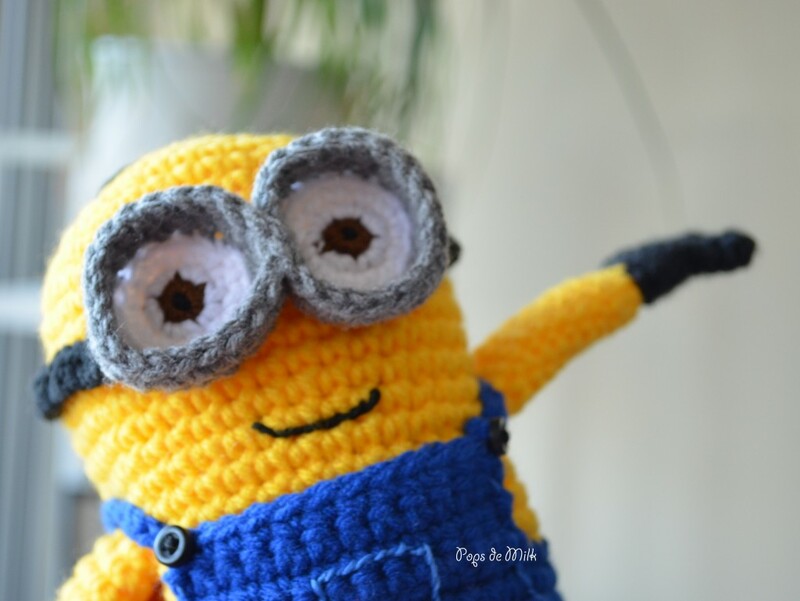 I’m currently crocheting the minion- fab pattern! I’m just having a problem following the pattern for his shoes ( I know it’s me being stupid- sorry), round 1, I keep making it 16 stitches at the end of the round, help, what am I doing wrong?